From the Oxford History of the United States series, an examination of Reconstruction and the Gilded Age as the seedbed of modern America. The 10th entry in the series, covering the United States during Reconstruction and the Gilded Age, may be the most erudite and sweeping of them all — as well as among the most timely, reminding during a time of turmoil that the divisive tensions of race and class inequities, economic upheaval, and regional schisms have deep, tangled roots ... a rich and breathtaking portrait of a country that, from Reconstruction on, really was under construction ... Above all this volume reminds us that the last third of the 19th century, populated by forgettable presidents, was no blank page in history ... This is a great and grand story, punctuated by debates over tariffs and taxes, pockmarked by corruption and congressional failures, and around it all swirled questions of race and the small dramas of farmers and miners, pioneers and politicians, suffragettes and suffering masses, railroads and reformers. It is a large bite White has assumed, and a major commitment for the reader, but its rewards and lessons, too, are great and grand. In the course of Mr. White’s overarching political and economic narrative, he draws sharp portraits of the men and women who peopled the Gilded Age. He is especially good at bringing color to the era’s monochromatic politicians ... Mr. White manages to make even the development of urban sewage and water systems engrossing through his deft interweaving of engineering challenges, hard-nosed city politics and shifting social values ... His gimlet-eyed views of capitalism are often on display in The Republic for Which It Stands, as are his ingrained sympathies for workers over speculators and Native Americans over the politicians and business interests that decided their fate. But Mr. White is too careful a historian to lapse into crude polemics or to sacrifice nuance for the sake of an agenda. If he is sometimes excessively caustic in his judgment of corporate behavior, he nonetheless renders the formation of a Gilded Age America—in all its social and economic tumult—with the complexity it deserves. The idea of home is a principle, a rallying cry, an ideal; and it’s one of the adroit symbols organizing Richard White’s The Republic for Which It Stands, a sweeping new history of the three teeming decades known as American Reconstruction and the Gilded Age … The Republic for Which It Stands demonstrates White’s subtle understanding of a period that may once have been regarded as ‘historical flyover country’—and of the American West … From a certain point of view, White’s history is also a history of Republicanism. One of the many merits of his book is his careful delineation of the underlying tensions in the party of Abraham Lincoln after the Civil War … White’s Gilded Age chronicle comes to its close as he returns to the image of Abraham Lincoln, whose sudden death in 1865 inaugurated the period. By the end of the nineteenth century, the country no longer belonged to Lincoln. 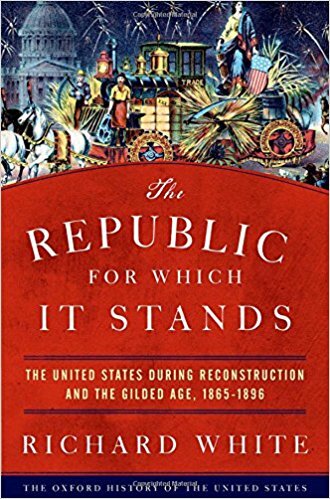 What did you think of The Republic for Which It Stands: The United States during Reconstruction and the Gilded Age, 1865-1896?